On Friday, Austen had a field trip that I chaperoned at the bowling alley. Afterwards I took him home so we could resume our special day together...just us. I gave him a choice of what we should do since we had to be back to school by 4:30 p.m. for swim lessons so it was lunch and the library; lunch and the Lego store; lunch and play soccer; or lunch and a movie. He picked the Lego store downtown. So off we went. We took the bus downtown and our first stop was lunch. Austen (my breakfast lover) decided he wanted chocolate chip pancakes for lunch. After lunch, we headed down to the Lego store at Watertower Place on Michigan Ave. That was after we made our way through the TV cameras by my office right in the middle of Chicago's famed Magnificent Mile. Apparently a shooting happened there the evening before. Gotta love the city. At the Lego store, Austen put together three Lego guys to take home and then begged me to buy him a Lego Ninjago set which I did. But not wanting Peyton to feel left out, I told Austen we should go next door to the American Girl store and buy an outfit for Peyton's Bitty Baby. Austen looked at me horrified. I can't go in there he said, everyone will think I am buying a doll! After I assured him that they would not and we would make it clear we were buying something for his sister he relented enough for us to find Peyton's doll a ballerina outfit. On our way home...we had some entertainment thanks to four separate homeless men. Austen seemed intrigued by these guys. Mommy, what did that guy's sign say he asked me? "I don't know," I said because I see so many of them downtown I don't read them. "Mommy, did you see that guy? He had no legs. What happened to them?" "I don't know," I said. "I know, " he said. "He was playing basketball. He fell down and broke his legs and he had to go to the hospital where they fell off and he had to get a shot!" "Mommy, what's wrong with that guy?" he asked as they are wheeling him on a stretcher to the waiting ambulance. "I don't know....maybe he's hot," I said as we walked past and Austen craned his neck to see more. Fourth homeless guy...muttering to himself rather loudly as people passed by. Austen didn't ask anything he just stared and stared until we were a safe distance away and then he started imitating the guy muttering. "That's not nice," I said. "We don't imitate people." And, that was enough of a city education for one day! It's sort of become a tradition to go to the beach on Father's Day. 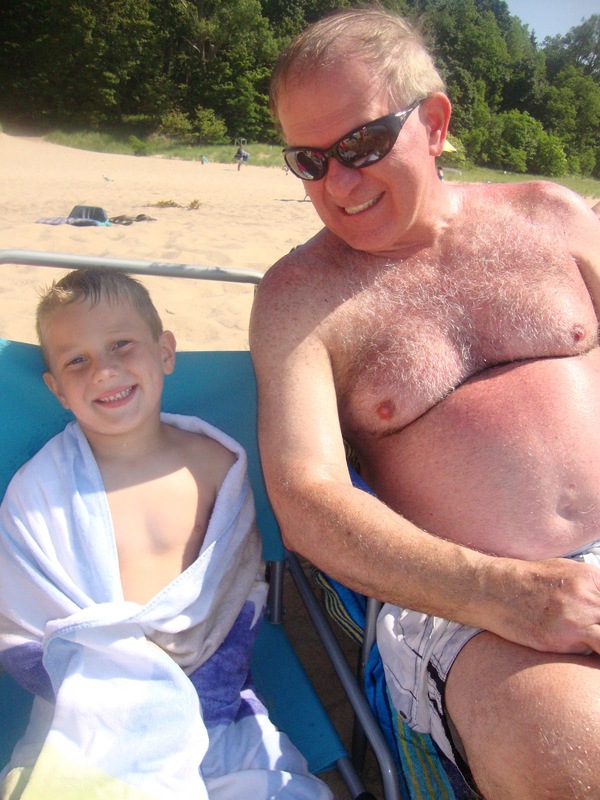 It's Tom's favorite thing to do on that day (aside from golf and he did that yesterday) and my Dad (aka Papa) enjoys the time spent at the beach with his grandkids too. 10. Making Daddy waffles for breakfast (his didn't have chocolate chips like ours). 9. Taking Adler for a walk to Starbucks with Papa too! You can't not have your coffee with two young kids. At least for the men in the family. I don't do coffee. 8. Stopping at Bari for some real Italian subs for the beach. Papa likes the old Italian store. It reminds him of the Old Country (even though he's never been!). 7. Building sandcastles all day. Daddy really gets into it and likes to make Peyton her own little pool in the middle of the castle. 6. Swimming out to the sandbar. Yes, there are sandbars in lakes. Who knew? 5. Playing frisbee in the water. Austen has way better aim than me! 4. Enjoying dinner outside at our favorite New Buffalo spot, Brewsters. We missed you Brewsters. Sorry, we couldn't make it last year. Peyton wasn't so good at restaurants. 3. Watching Peyton fish other people's change out of the fountain at the restaurant. Hey, at least she threw it back. 2. Stopping Austen from blowing his bubbles I bought him at the restaurant because the wind was blowing them into other people's food. Yuck! 1. Papa spilling his to go cup of coffee (round two of the caffeine) on the way out of the restaurant. Sorry waiter! Happy Father's Day to all the Dads. I hope your day was as great as ours! Lately, Austen has been very attentive to Adler. When he wakes up in the morning he always kneels down next to her and pets her and asks her how she's doing. And, more often than not now he'll just randomly sit down next to her and start petting her or talking to her. This past week, Adler very playfully stole one of Peyton's doll. While Peyton whined that Adler took her doll Austen calmly went up to Adler and retrieved the doll. But not wanting Adler to feel left out, he went and picked up one of Adler's toys and gave it to her so she would have something to play with. Yesterday, I was telling him as we pet Adler together that we have to love Adler every minute we have her now because dogs don't live as long as people and someday she won't be with us. "Will we get another dog?," he asked. "I don't think so," I said. There will never be another Adler. We rolled into Cumberland, MD at our hotel at 3 a.m. CDT. 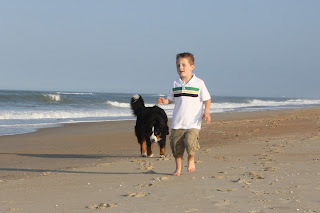 After a few hours rest, we were back on the road early the next morning and it took us until dinner time to get to the Outer Banks. But we made it! We had this amazing house. Six bedrooms, 5 1/2 bathrooms right on the ocean for just our little family but it was perfect. On one side was a view of The Sound and the other views of the Atlantic. The beach was essentially your private beach and the houses on either side of us were vacant so we had a few hundred yards of beach all to ourselves. Let the fun begin...except the next day there was rain. It was Sunday and not too much open so we decided to drive a little further north (you have to drive on the beach with a 4x4 vehicle there) to see the wild horses that I had heard so much about when I came before but never saw. I was determined to see them this time except they must've been taking cover from the rain too. No horses. Despite the weather on our first full day at the beach house, the weather was great the rest of the time. The kids enjoyed making a lot of sandcastles (or maybe it was really Tom that did). 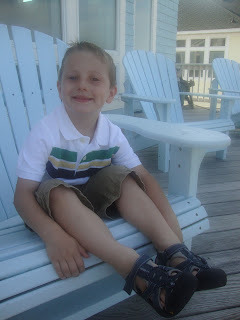 We tried out a lot of restaurants in the OBX and Peyton was good most of the time. Here she is pictured at the restaurant Austen had an infamous meltdown at when he was her age...The Sunset Grille. Unlike him, she didn't throw noodles at the window! They ate lots of ice cream. They played in the pool that was part of our house and were excited when they found the sand crabs that had fallen into the pool. They enjoyed hanging out with Adler on the beach. 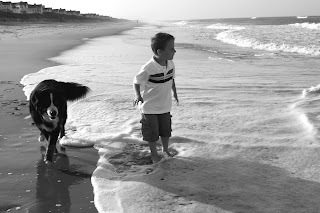 Adler went nuts protecting Austen from going too far out in the waves. And, we finally did get to see the wild horses! My fondest memories of my vacations as a kid revolved around the beach. I hope mine feel the same.